A new patch (1.09) has come through for NBA Live 18. The relatively small update is available for both PlayStation 4 and Xbox One, and should download automatically as long as you have an active Internet connection. If you encounter any issues, try restarting your console. There aren’t any official patch notes as yet, but it’s quite likely that the update simply adds compatibility for the forthcoming LIVESTRIKE Events. 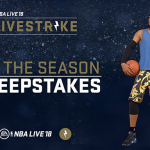 From December 19th-25th, gamers will have an opportunity to earn in-game gear that they may have missed during the previous LIVESTRIKE events. Furthermore, by earning the in-game clothing from Undefeated, BAPE, and Pink Dolphin, and submitting a screenshot of your player wearing it, you can enter the Outfit of the Day Sweepstakes to win some real gear. Please note that the sweepstakes are only open to US residents. Full terms and conditions can be found here. If any further patch notes are provided, we’ll be sure to post them as soon as possible. In the meantime, you can check out a full update history for NBA Live 18 here in our Wiki. Feel free to discuss the patch and the LIVESTRIKE events in the comments section below, as well as in our NBA Live 18 Forum.